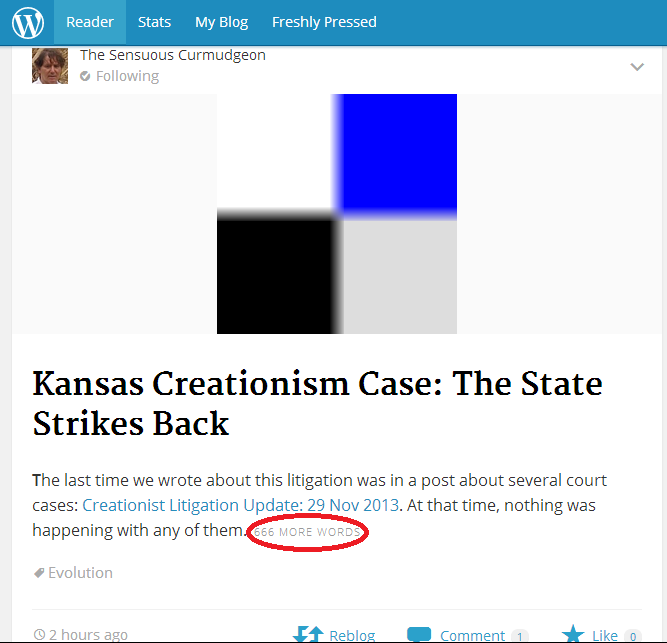 The last time we wrote about this litigation was in a post about several court cases: Creationist Litigation Update: 29 Nov 2013. At that time, nothing was happening with any of them. We’ve been calling this one the Kansas NGSS Case, because suit was filed in the US District Court’s Topeka office (for those who don’t know, that’s in Kansas) to bar the state from implementing the evolution-friendly Next Generation Science Standards (the “NGSS”). The creationist plaintiff has the Orwellian name of “Citizens for Objective Public Education, Inc.” (COPE). You can find generalized links to information at the Justia website: COPE et al v. Kansas State Board of Education et al, but you can’t access the court’s docket, which lists what’s been filed, and you can’t read the pleadings without a PACER subscription. Our friends at the National Center for Science Education (NCSE) do have a subscription, and they’re archiving the pleadings here: COPE v. Kansas State BOE. We always like to call your attention to “Exhibit A” attached to the complaint, which starts at page 37. It’s an astounding collection of mind-numbing creationist arguments. In documents filed on December 5, 2013, the defendants in COPE et al. v. Kansas State Board of Education et al. asked the United States District Court for the District of Kansas to dismiss the suit, saying … that the court lacks jurisdiction over all claims asserted in the complaint and that the complaint fails to state a claim against the defendants. COMES NOW, all Defendants, by and through counsel, and pursuant to Fed. R. Civ. P. 12(b)(1) and (6), move this Court to dismiss Plaintiffs’ claims. This Court lacks jurisdiction over all claims asserted in Plaintiffs’ Complaint (Doc. #1), and the Complaint fails to state a claim against Defendants. Pursuant to D. Kan. R. 7.1(a), Defendants simultaneously file a memorandum in support of this motion. Here’s a link to that memorandum, which is archived at the NCSE website. Yowie — it’s a 48 page pdf file. Looking at the Table of Contents, it covers these subjects: the state has sovereign immunity, the plaintiffs have no standing, the science standards (the NGSS) are secular, not religious, and they have nothing to do with Secular Humanism. The standards don’t violate the Constitution’s equal protection clause, nor do they restrict the plaintiffs’ right of free speech. If you’re addicted to reading documents like that, dig right in and let us know if there are any goodies to be found there. Our only response is a cold shudder. Your Curmudgeon has always avoided debating creationists, because they’re either deliberately lying (and will go on doing so), or else they’re flat-out insane and have no cognitive ability at all. Either way, it’s a waste of lifespan to even talk to them. That’s why the Attorney General’s office has our sympathy. It must be intellectually daunting to be faced with a totally garbage lawsuit that makes all kinds of garbage claims, and to have to draft all this stuff in order to defend against it. The state also filed this Motion to Stay Discovery, which asks that all discovery be suspended until the court has ruled on the state’s motion to dismiss. Thus ends today’s episode of the creationist soap opera in Kansas. [*Tear-jerking music swells in the background*] Will the good, god-fearing folks of Kansas triumph against the satanic evolutionists? Will the atheist state force its godless theory of evolution on the innocent children? Stay tuned for the next thrilling episode of Kansas, the Flat Earth State — Rapture or Retribution? I have family roots in Kansas (my great-grandfather homesteaded a farm just south of Topeka in 1857) and grew up in Texas. I’m gratified that my Texas compatriots finally got their head on straight and did the right thing. I also glad the State of Kansas is fighting the creationist attack on the new science standards. Maybe they (the State) will eventually have their head on straight. Kudos to all the “anti-flatearthers”. Texas did not get off totally free of having to deal with this same kind of nonsense. One of the creationist book reviews wrote a 12-point complaint about the biology text book that will still be reviewed. Of course, it’s 12 points of Discovery Institute mined quotes and other factually incorrect stuff, but amazingly as it may seem, the state STILL has to address them rather than laughing the numbskull out of the room. Same here. Old Calvert is still up to his decades old tricks with nothing but creationist talking points and factually incorrect statements. If Calvert prevailed then it would be possible for Deepak Chopra to teach Cosmic Consciousness right in physics class. Yes, it’s total woo and BS, but as a non-material explanation that requires no evidence (basically that’s Calvert’s argument) it could be taught as equivalent to anything in science. And, just think, there’s an infinite amount of woo because it’s all made up. This pretty well shuts the door on the Enlightenment, for now science can no longer ask questions about man and the universe. Strictly verboten! Let’s see now children, what were the Four Body Fluids or Humours Proper? @docbill1351there’s an infinite amount of woo because it’s all made up. Just like the products of unfettered design. Kansas was one of the Lead State Partners in developing the NGSS. They have skin in the game, so to speak. Sensuous Curmudgeon recommended that we read the Krazy Kansas Kreationist Komplaint starting at page 37, so I did so. 1. The creationists say Intelligent Design must be taught [p. 38, 39, 41, 47], even though it was defeated at Dover, but they don’t call it “Intelligent Design”. Instead, they have coined still new phrases to describe ID. This is their “Plan B” as you predicted. For examples, see my Appendix, below. 2. They several times oppose teaching evolution or environmental issues because critical thinking by students is bad and they should not be allowed to make up their own minds [p. 43-4, 47, 51], but in at least one instance, demand teaching the “weakness” of TOE because critical thinking is good and students should be allowed to make up their own minds [p.37]. 3. They say evolution is a religious belief of the religion of what they consistently call ‘Religious (“Secular”) Humanism‘, which is an oxymoron, as “secular” by definition means not religious. However, as Josh Rosenau of NCSE documents, John Calvert, the litigious head of IDnet, has in the past written in his legal claims, and used as a legal argument, that secular humanism is NOT a religion. Rosenau, helpfully, also tots up previous court decisions where judges explicitly rejected the argument that evolution is a religion. So secular humanism is a religion when that means you have to give equal time to creationism, and secular humanism is not a religion when that means you have to give equal time to creationism. 6. They define Methodological Naturalism [MN] as mandating by definition that “only atheistic or unintelligent cause explanations are permitted. MN requires that all evidence of an intelligent cause be ignored or somehow attributed to a natural cause” (p. 39), an outright lie, since archaeologists and anthropologists can attribute artifacts to intelligent human creators using conventional (non-ooga booga) methodology. 7. They repeatedly demand that their false definition of Methodological Naturalism be clearly defined exactly the way they demand it be defined, in the text and in a Glossary (the demand for a Glossary is key), and that “students must also be informed of the evidence and alternative explanations that are excluded by the assumption [of MN] so that they acquire a genuine appreciation and understanding of its [MN’s] overall effect.” [p.39] This is code-speak meaning that children must be taught that evolution is supported by no evidence, only by the assumption that supernatural explanations are not permitted: “MN rules out the competition by assumption rather than by the evidence“ [p.41]. There then follows the usual crea$h!t arguments: mutations are always harmful, bullprob (Hoyle’s fallacy), genetic code is a language, macroevolution is controversial, fine tuning, etc. 3. Creationism Code Word #3: “evidence that would be considered but for the use of MN”; or “evidence and alternative explanations that are excluded by the assumption” of Methodological Naturalism. “Children should be informed that MN [Methodological Naturalism] is being used in the historical and life sciences and that there is a significant body of evidence that conflicts with its materialistic assumption. Many recognized scientists believe it should be abandoned in certain areas of historical science, where it impedes rather than aids open-minded inquiry. The assumption of materialism (MN) is incompatible with science education that must respect the religious rights of children, parents and taxpayers. The effect of MN is to lead children to accept atheistic explanations of the origin and nature of life, rather than to question them. Here they concede that Intelligent Design is a religious belief. Curm, if you’re free I’d be obliged if you got my comment out of moderation. Thnx. Diogenes, I retrieved your comment, and doctored it up a tad. Thanks for all that effort, Diogenes. I cringe every time anyone from the reality community uses “design” to describe a natural process, which is often. As with careless use of “theory”, this seems to me intellectual sloppiness that plays to the interests of anti-science zealotry.